What follows is an essay by a commenter on Gates of Vienna named Kierkegaard. He submitted it originally in a somewhat different form. After several exchanges, perhaps this final collaboration will serve to convey the meaning he intended. If it does not he is, of course, free to excoriate this editor in the comments. At any rate, it grows late and Hallowe'en will soon be over so this has to be posted in its present state. Tonight marks the culmination of the celebration of Ramadan in the 'Night of Power', the holiest night of the year in the Muslim calendar. It also happens to fall on the same night as Hallowe'en. For Muslims, it is a sacred commemoration of the moment when Allah first spoke to the Prophet Muhammed. For Westerners, secular and Christian alike, it is 'All Hallows' (or Sainted Souls') Eve', when the dead walked the earth, before all the Saints rose to rout them with the dawn. This, of course, was originally a pagan autumnal festival, called 'Samhain' in Celtic tradition, long since co-opted by the Christian Church--just as Ramadan has its roots in a similar neolithic past. Let us consider for a moment the humble church-tower bell, so beloved by Lord Peter Wimsey in The Nine Tailors. In the Tolkien-like village life of our ancestors these bells served as a warning siren, a time-piece, a reassurance that all was well in the world, and a reminder to pray. To fear or flee the bells was in itself considered a sure sign of possession by a demon. Bell-ringing began as a church-approved technique of driving evil spirits away -- human voices, raised in song, were considered insufficiently noisy for the task. The origins of Islam are enshrouded, to some degree, in a mystery enforced by Islam itself. Over the centuries, the version of the sacred texts or 'suras' on which the Quran is based has become limited, in the Sunni world, to a paltry few based on the work of 'approved' scribes. This approval has come about, not through scholarship or debate, but rather through violent enforcement (the codification of the Christian New Testament was not a process of polite disagreement either. However, it has some been centuries since any scholar — i.e., “heretic” — was murdered by the state or the Church for debating, analyzing or studying the Gospels). Muslims believe that their prophet Muhammed received their sacred texts (suras) directly from God. Or rather, they believe that Allah received them, whole and intact, through the agency of the Archangel Gabriel. Armed with the sacred word, Mohammed then set out to convert the polytheistic tribesmen of the desert, later bringing his received truth to cities such as Mecca and Medina, where some received it gratefully and others, as the result of their 'apostasy', had to be put to the sword. Problem One: Allah (the Hebrew 'El') was the chief god of this pagan pantheon, not a monotheistic new-comer (neither was Yahweh to the Jews). Problem Three: to become an apostate, there must first exist a religion that can be betrayed and Islam is by far the youngest of the world's 'major' religions. Problem Four: recent scholarship in Germany suggests that some of these original suras of Islam, far from 'bypassing' versions of 'pro-Semitic' myth (as for example in the Muslim version of Genesis), were in fact taken from Syriac Christian scripture. Islam has a way of obliterating other histories. Thus, long buried is the fact that Islam’s first invasion of the Byzantine Christian world did not receive a warm welcome. Mohammed's received religion was viewed by the Church not merely as a fresh heresy akin to the Manicheans, Arians, or Pelagians. Instead, Islam was viewed as something altogether new and more alarming: a heresy qualitatively worse than those arising out of internecine Christian conflict. Thus, Islam must have been inspired directly by Satan. The very name of Islam's founder, Muhammed, Mahound, or 'Mahomet', was transformed syncretically by Christians into the name for the major demon, Baphomet. Through this transformation, Christians thus believed the Muslims worshipped a demon. Later on, this perception of Islam would be important when evidence of Baphomet's worship was a major charge in the persecution of the Order of the Knights Templar by the Pope and King Philip of France. The Knights Templar (Knights of the Temple of Solomon) alone among the Crusaders had conducted scholarly studies and performed what would be seen today as cultural exchanges with Islam. Through these exchanges an alliance sprang up between the Templars and the Shiite Ismalien sect of Islam called the "Assassins' (because of their addiction to hashish; it was they who invented the suicide assassin 'martyr'). The Assassins were headquartered in the Bekaa Valley of Lebanon and also had a base at the castle of Al-Alamut in northern Iran (Marco Polo witnessed the later destruction of the castle --The Eagle's Lair -- by the invading Mongols in the 13th Century; he wrote a detailed description of the sect in his 'Travels'.). During the early 1200’s this alliance between the Templars and Assassins helped to maintain stability in the Crusader kingdoms until the fall of Acre (Biblical Akko). After that the Templars' usefulness to the West was ended and this alliance with Muslims was used against them. The Ismaliens, however, continued as a geopolitical force long after the Mongols had attempted to exterminate them. Their modern titular leader, the Aga Khan, continues to derive his title and a portion of his wealth from the sect even today from his ancestral home in Pakistan. Now the Iranian Shiite descendants of the Assassin Order still command by proxy the assassinations of Western and Israeli soldiers and civilians across the Middle East exactly as they did nearly a thousand years ago, using much the same combination of drugs and money to train their emissaries. They have a different name in the West now--they are called 'suicide bombers'. Many modern Westerners, in fact, accept as their gospel the idea that "the Great Satan" is indeed the West and its cultural horrors. In this convoluted self-hatred mainstream American churches merely reflect the views of their ever-shrinking liberal constituencies. Thus, when the mullahs who rule Iran hold 'terrorist conventions' complete with 'martyrdom booths', or 'Death to Zionism' conferences, or even export the publications published for them to the Frankfurt Book Fair few voices are raised in protest within Western religious ranks. The use of the term Satan (more properly 'Shaitan') in Islamic theology continues to be misunderstood in the West, despite its "respect" for Muslim belief. For Islam, the name, Satan, does not refer to an actual entity but is a concept embracing all evil. The Shaitan in the Muslim version of Genesis is specifically named 'Iblis' and is an 'ifrit' ('afreet') or demon. This term, Shaitan, seems to have evolved from a word meaning 'astray' or 'misled.' Eventually, this idea came to be the metaphorical interpretation of Satan's primary role in the Christian Bible as well. So when the President of Iran names the United States as the "Great Satan" he does not mean to say we are literally the body of Iblis. Instead, he is calling us the chief source of evil in the word. Salman Rushdie's conflict with the mullahs illustrates this point. In his novel The Satanic Verses, Rushdie dared to suggest allegorically that perhaps parts of the Quran were "misled," inspired alternately by a 'good' angel and an 'evil' one. Such "literary criticism" of the Holy Book, which may never be altered or mocked even allegorically, is an automatic death sentence for whomever utters it. Rushdie’s heresy led even the Sunni Egyptian Nobel prize-winner Naghib Mahfouz to back the murderous 'fatwa' pronounced against Rushdie by Ayatollah Khomeini. As V. S. Naipaul observed, the Iranians were merely exercising literary criticism of their own. Naipaul and Mahfouz are sophisticated, Western-educated writers who represent the face of 'moderate Islam', yet this is how they speak and think on this single, inflammably irrational subject. A further irony is that Rushdie was merely echoing the Greek New Testament chapters in which a voice whispered temptations to Jesus, as he wandered during his fast in the desert. Jesus rejected this voice out of hand, recognizing it as that of the Devil. Small wonder then, that in the view of Christian theologians for nearly a millennium, when this same experience befell Mohammed (as it did so many Christian saints), he did not order the voice to depart. Instead he heeded it, and proclaimed that what he heard was the voice of God speaking through an angel. Once Christianity understood the origins of the Koran, Papal Bulls were explicit on this matter: Mohammed was mistaken about the source of the voice he heard in the cave. Much later, Jeanne d'Arc was to burn at the stake for following her voices. So where do things stand now? Is it that the West, and Christianity on which it was founded, has been the one to change while Islam has remained exactly the same? Is this the root of the "clash of civilizations"? Obviously, Christianity has changed, but so has Islam; over the centuries it has fractured, divided, and adapted to the various cultures where it has taken root. What has not changed is the Koran and the fundamentalist tenets of its followers. Thus, even "moderate" Islam becomes baffled and contemptuous for what it sees as the West's lack of belief, and particularly our treasonous rejection of our heritage. But I don’t understand why someone as politically keen as The Nation’s David Corn would lend his name to the editorial board of Pajamas Media, the greatest assembly of conservative deadbeats since Jonah Goldberg’s last fondue party. What an illustrious roster of ideological utensils make up Pajamas’ masthead: Michael Barone...John Podhoretz...Tim Blair...and this inveterate stirpot, whose presence all decent men and women should shun until proper disinfectant can be found. By allowing his name to be slated on the editorial board, Corn is letting himself be used as a figleaf enabling Pajamas to pretend that it’s a bipartisan effort instead of what it so flagrantly is, a neocon popstand. Wilkerson isn’t stuck you understand — the man never left stupid in the first place. It's where he lives. In the late 1970's, I spent some time working in the VA Hospital system. At that time, the primary Psychiatric population we treated were those whose psychiatric problems fell under the category of "service-connected disability." Patients with SC disabilities received a significantly higher monthly disability payment, as long as their psychiatric problem persisted. A subset of patients, mostly young, Vietnam era vets, was created who were hospitalized for short stays every 6 months. According to VA rules, if you were hospitalized every 6 months, that was considered a priori evidence that you were still disabled. "We are carrying out a broad operation against terrorism, a broad operation against the Islamic Jihad infrastructure in light of Islamic Jihad's intention to continue with suicide bombings," Mofaz said ahead of the weekly Cabinet meeting. "We are making huge efforts to prevent these attacks ... and this activity will continue until we can say that the Islamic Jihad infrastructure can no longer carry out suicide bombings," he added. Thunder Pig has joined the task force with Introducing...Armchair General Thunder Pig?!? Jesse Clark has his take up at Armchair Generals Conference - WWIV Edition. The Islami Inqilabi Mahaz (Islamic Revolutionary Group), an obscure Kashmiri militant group, claimed responsibility on Sunday for yesterday bomb blasts in India's capital which killed at least 61 people. However, security officers see the hand of Lashkar-e-Taiba (Force of the Pure), a Pakistan outlaw group, in a new attempt to derail the peace process between India and Pakistan. - It is fantastic good news that Damas de Blanco gets the Sakharov Prize. The publicity that this prize is bringing is invaluable for these brave, peaceful ladies supporting their imprisoned husbands. In their situation they need all the support from the outside world they can get. This again shows that the situation on Cuba is extremely serious and that the EU has to take action. There’s a new exclusive club, succinctly named Zionot. It has the elegance and brevity of a mathematical term. Its aim is as lethal as sniper’s bullet. This effort, dubbed “The World Without Zionism,” is being co-ordinated during a week of special events in thousands of mosques, schools, factories, etc. It is designed to create a critical mass of jihadist zeal. Syria and Lebanon and even Afghanistan are holding simultaneous activities for the same purpose. Ahmadinejad’s vision is apocalyptic. This is not about politics; this is about religion. It’s important to remember that religion and politics are one and the same for Islam. That’s why there can be no negotiation, only holding patterns. Of course the “world community” has reacted predictably with stern notes, lectures to Iranian ambassadors, and announcements by governmental leaders regarding their grave concerns. Always on the brink of hell, we have pronouncements about grave concerns. It is the mass graves that should concern us. To an outside observer, the fantasist is clearly attempting to compensate by means of his fantasy for the shortcomings of his own present reality — and thus it is tempting to think of the fantasist as a kind of Don Quixote impotently tilting at windmills. But this is an illusion. Make no mistake about it: The fantasist often exercises great and terrible power precisely by virtue of his fantasy. The father who demands his son grow up and become a professional football player will clearly exercise much more control over his son’s life than a father who is content to permit his child to pursue his own goals in life. This power of the fantasist is entirely traceable to the fact that, for him, the other is always an object and never a subject. A subject, after all, has a will of his own, his own desires and his own agenda; he might rather play the flute instead of football. And anyone who is aware of this fact is automatically put at a disadvantage in comparison with the fantasist — the disadvantage of knowing that other people have minds of their own and are not merely props to be pushed around. For the Arabs and their fellow travelers, anti-Semitism is the air they breathe. Jews are not real; they are evil “props to be pushed around,” even eradicated. Why now? Why, at this juncture, did the president of Iran pick up that old discredited 20th century banner? Why the New Holocaust? Let’s look at the lay of the land. Iraq, despite the efforts of the global appeasers, is on its way to becoming a functioning democracy. The nationwide vote on the constitution reverberated throughout the unfree Islamic states. With the Coalition’s support, Iraqis are on the road to the 21st century. Syria, humiliated by its forced relinquishment of the golden goose on the Mediterranean littoral, now faces the imminent collapse of the Baathist Party and the Assad dynasty. Egypt is holding elections of a sort. Jordan has its head down, hoping to avoid the shrapnel, while the wicked House of Saud is frantically shoring the walls of its house of cards. Meanwhile there is that Wall in Gaza, a monumental insult and reminder of failure to the Palestinians in particular and the Islamic world in general. Things are unsettled, to put it mildly. 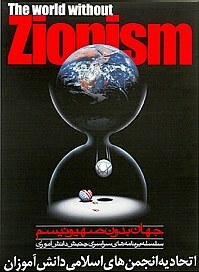 The only bright spot, from the point of view of the Great Islamic Jihad, is those Iranian nuclear weapons. For a long time the mullahs waltzed with the French, marking time and making faces until they could finish the plan that has been so long a-borning. The ultimate fantasy, about to become a murderous reality. …there remains the question of why the Iranian government is doing this. Iran has a reasonable intelligence apparatus, and the information I have set out is all in the public domain (see Global Security.org or the International Institute of Strategic Studies’ publications for more). All I can come up with is that a domestic crackdown on enemies of the current mullah regime is imminent, (particularly those in the universities), and the targets are being set up as Zionist agents. There is some kind of Iranian website (see the photo on the Real Clear Politics Blog)which is apparently part of the campaign. The Mullah regime is in serious economic trouble: the Shah’s reign was a golden age in terms of wealth and liberty by comparison with this government. Another possibility is to justify deeper Iranian involvement in Iraq -- the forward outpost of Zionists and Crusaders. But I think the other possibility (the domestic crackdown) is far more likely. Most Iranians require no justification for intervention in Iraq. Given the pre-emptive and lethal nature of Zionot, the possibility of a general Middle Eastern conflagration has escalated into the red zone. Is this the Big One, the one in which the boiler finally explodes? Perhaps some kind soul will send him a copy of Shelley’s poem. Gates of Vienna suggests that a Farsi translation be slipped into Condoleezza Rice’s briefcase for her next trip to Teheran. NB: This post was a Baron-Dymphna collaboration. They are still speaking to each other. Dr. Sanity is writing songs again, this time mixing Oil-for-Food with Gilbert and Sullivan. Everyone should go read (and sing along to) I Am the Very Model of a Secretary General. Well, at least it’s now out in the open, and even the Europeans will have to admit it: Iran wants to completely destroy Israel. We always knew it was true, but now it’s clearly stated Iranian government policy. Although Israel is widely believed to have its own nuclear arsenal, it fears such weapons falling into the hands of hostile states. In 1981, when Saddam Hussein threatened to develop a nuclear capability, Israel launched a pre-emptive air strike to destroy Iraq’s Osirak nuclear reactor. Unilateral military action by Israel would be much harder against Iran’s nuclear capability. Military jets would have to fly much greater distances, and the Iranians have spread their nuclear programmes across a number of sites - some located under mountains. However, Israeli military planners are believed to have a number of options including air strikes using American-designed bunker-busting munitions and commando raids. Don’t expect the Europeans to support any action that Israel might take, and don’t expect them to do anything but condemn it afterwards. And, if the State Department and the Arabists and the Old Guard Republicans in this country have their way, the Jewish state will get no support from the USA, either. There was a time when the Jews stood meekly on the railway platforms amid their meager belongings, boarded the freight cars, and departed docilely for their unspeakable destination. But the state of Israel is unwilling to go gentle into that not-so-good night. If necessary, the Jews will fight their enemies alone, since the alternative is national extermination. Israel has never lived without a threat to its existence. The truth of the matter is that Israel has never been accepted as a permanent nation within the Middle East by the 22 Arab nations, and much of the broader Muslim world. First the Arabs fought to prevent Jewish settlement within Palestine, and then fought the UN partition plan to create two states within the British mandate territory. After the British left, and Israel declared its statehood in 1948, the war against it resumed. The history of Zionism is a history of terrorism and war, but through it all, the tenacity of a people building and defending their new state. Western Europe’s governments have already effectively abandoned Israel, much as they did Czechoslovakia in 1938. It is too much of a burden for them to defend Israel, what with their surging Muslim immigrant populations to appease with the bone of hostility to Israel. And of course since Israel is a close ally of the United States, Europe’s envy of America and its power and world leadership works its way to the surface by confronting the US in the Middle East conflict, through support of the Palestinian side in international organizations, such as the UN. 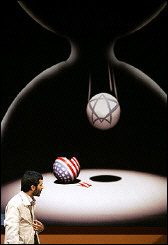 If the United States abandons Israel, then the Israelis will have face the Iranian threat alone. But face it they will. If I were one of the mullahs, I wouldn’t be sleeping well at night. Well, good for him. Are we sure he’s a European? Some call this evil Islamic radicalism; others, militant Jihadism; still others, Islamo-fascism. Whatever it is called, this ideology is very different from the religion of Islam. Mr. President, are you sure that’s true? Does violent jihad represent the essence of the religion of Islam? Is the existence of the “moderate Muslim” possible? I don’t pretend to be able to answer these questions, nor do I think it is possible to answer them yet. But they should be uppermost in our minds as we watch current political events unfolding across the world, and especially those unfolding across the bloody littorals of Islam. The central problem is that Islam is more than a religion. It is a blueprint for political action, one whose core text requires the adherent to be violent in the pursuit of political goals. In this respect Muslims bear more resemblance to Communists than they do to Presbyterians. But there are peaceable Muslims. The ones I know personally look and act like ordinary Americans. The women don’t wear the hijab, and the girls go to school and act like any other American kids. Will the truly observant Muslim always engage in or support violent jihad? Do you really think all billion muslims hate the west that implacably? Do you think there is any practical program that will lead to the elimination (or forcible conversion) of all the planet’s muslims? I often wonder where the logic of “all Islam is out to get us so we had better do something about it” leads. So where does it lead? If the enemy is in our midst, but not actively pursuing violence at the moment, what do we do? And are all Muslims our enemies? We know that some of them are, and it is a reasonable assumption there are some among us who are even now planning to harm us. But is the proper response to declare that all Muslims are our enemies? Wait a minute. We’ve seen that road before, and we’re not going to follow it. The civil liberties accorded citizens of this country protect people from being targeted simply for their beliefs or membership in a particular group. Yet members of a particular group are plotting to do the country harm by murder, mayhem, and levying insurrection. If they succeed in their diabolical plans and unleash a devastating attack within our borders, people may well take the law into their own hands and civil liberties will be thrown out the window. I don’t buy the idea that we should just be quiet and let domestic law enforcement do its job. 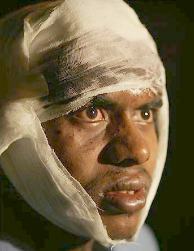 I’m certain that it has indeed interdicted many terrorist attacks since 9/11, but Able Danger and Annie Jacobsen’s experience on Flight 327 and the Jamaat ul-Fuqra compounds and the farce that masquerades as airport security have all convinced me that incompetence rages throughout the system. First and foremost is to propagate as much information as possible. Turn over every rock. Open all the closet doors and turn on the lights. Bust open all the rotten stumps so we can see the termites inside. 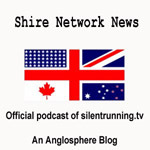 Spread the word, because that is what the blogosphere is for. But let’s be sure we distinguish fact from speculation and rumor. And above all, remember that incitement to violence is the enemy’s specialty, not ours. The second tactic is political. We are not going to be able to control the mujahideen in our midst if we don’t shrug off all the politically correct nonsense that hobbles us, and also control our borders. The current administration seems to have no will to do either of these things, and the next administration, no matter which party takes office, is unlikely to do any better. Therefore we’re going to have to throw out an awful lot of rascals, and elect people who will shake the entrenched bureaucracy until its back teeth rattle. Any other ideas out there? This is an open forum. Somewhere between the extremes of “Islam is a religion of peace” and “nuke the ragheads” is a course of action which will protect American citizens and also secure their liberties. I invite you to help me find it. Calling all armchair generals! Gather at the Gates and make yourselves heard! I have been saying for a long time that the solution to the problem that islam poses is a simple one if we only have the courage and vision to pursue it relentlessly. Just tell the truth about it. A big problem with islam and muslims is that they do not understand this. They equate open rejection of their beliefs as hatred and bigotry mainly because their own leaders encourage them to do so by their example. But coming as they do from their original environment which is devoid of the hurly-burly of true democracy and liberty, they are easily mislead to shut their ears to the "bigots" who dislike all muslims and are encouraged to dismiss all criticism of their religion as ignorant. If we happen to think that islam is the worst idea for a religion there ever was but have no inclination to hate those who believe in it then we have to distinguish ourselves from the true haters by our conduct, by our charity and hospitality towards all. What’s the difference between a victim, a fatality, and a dead hero? Let us consider some lives and some deaths. Let us see if there may be a thread that connects them. Over on The Neighborhood of God I described the bloody death of a 7th century young woman who’d valiantly fought off and escaped her incestuous father, only to die by his sword anyway, far from home. In my view because she refused to submit, Dymphna therefore was not a victim. However, one of my commenters disagreed. Did the simple fact that she failed ultimately to escape her father's sword seal the meaning of her life? I can understand why someone might see it that way, though her death is not how I choose to characterize Saint Dymphna; to me she is defined in her refusal to submit the core of her integrity to another person. Yes, her refusal contained her death warrant, but it was that very defiance which ultimately trumped her father’s rage. Dymphna’s courage and determination resonate down the centuries, bearing a signficance she could never have imagined. I’ve been thinking about the cries that he is being victimized by the left-- and how ignoble a title “Victim” to bestow upon a warrior. My commenter is exactly right: the sergeant is a Warrior and the burden of fools who latch onto his death desecrate his life and do themselves dishonor. Last year, there was another death in Iraq, one which stood out from the thousands of victims of this ugly war. Remember Fabrizio Quattrocchi? Remember his defiance? Mr. Quattrocchi didn’t choose death. But when it showed up wearing the visage of evil, he turned and faced valiantly what he could not escape. Attempting to tear off his mask, he yelled his last words: "Now I'll show you how an Italian dies." Was Quattrocchi a victim or did he choose valor in his moment of dying? Whichever you choose, his defiance ruined his captors’ plans to show the video of his death; his bravery was dangerous and had to be hidden from view. If anyone in recent times can be said to have taught us how to die, it is this Italian contractor, lifted out of his anonymity for the purposes of an evil propaganda machine which he then broke, at least for the moment. Just three examples: the girl, the sergeant, the contract worker. None of them chose to die, but all of them chose how to face death. One in defense of her integrity, another in the defense of his country, and the last because, like the first, he refused to submit to evil. Meanwhile, back here at home, in 2003 — the year the war began in Iraq — forty two thousand people victims died in traffic accidents. They died for no reason. 42,643 people are gone and from none of their deaths can we salvage some small shred of consolation. These horrible deaths are merely wasted lives, cut off without reason. So where is the hue and cry? Where are the headlines? Where are the protestors demanding that something be done about this on-going annual carnage right here in our country? Extrapolating from the figures for 2003, we can reliably estimate a death toll from traffic accidents (in the United States alone) of at least 125,000 men, women, and children dead since the start of the war in Iraq. Where are the Cindy Sheehans to carry on about this ignoble carnage? Where are the placards blaming…blaming whom, precisely? The car manufacturers? The highway engineers? The government for not setting a lower speed limit? The people who exercise their freedom to drive? In our rural county, the annual death toll of inexperienced adolescent drivers is high. Or so it seems, given that our population is small and mostly we already know those kids who don’t make it around the curve. Their deaths fell their families; we weep for youth and potential cut off so suddenly and if we have teenagers, we wonder if our child will soon lie among the others. But our tragedy has no edge of valor to soften it. There is only the ugly specter carrying his scythe, reminding us how indiscriminate and cruel is his harvest. I leave it to you to sort out and assign the labels and their meanings. The valiant and the victims already know who they are. Earlier today I wrote and posted a bitter satire which several readers (and at least one spouse) considered somewhat — um — intemperate. Wiser heads prevailed, so I took it down. Deleting my post left me feeling dissatisfied and stifled. After mulling it over, I decided to revisit the same topic, this time without the irony. This post will be serious. Dead serious. One of the advantages of a site meter is the ability to monitor visitors’ searches. Presumably most bloggers are familiar with the disgusting and perverted things that people are trying to find on the internet — if a few of the keywords match, sure enough, they show up at your site. We get our share of these visitors, mainly because of Dympha’s concerns regarding the treatment of Muslim women. But they all boil down to the same thing. What gives one pause is this: the certainty that somewhere out in the world, at the other end of those searches, are people who want to do us harm, evil, twisted minds that long to attain paradise by killing as many infidels as possible. Every day more searchers arrive here, a steady drip… drip… drip of rancid malevolence. Moreover, those who wash up at the Gates of Vienna are but a sample. Instead of this nest of kaffirs in the heart of Dar-al-Harb, the more intelligent and adept jihadis have long since found their way to the real bomb-making instructions. Think of the thousands upon thousands who must be out there searching. Some of them are in the West. Some are in America. And some are right down the road. After a while, it does weigh a body down. My fantasy is to draw in these deadly Islamists and prepare an ingenious trap designed solely for the unwary mujahid, and — like a genetically-tailored virus which will infect only one host — cause them to self-destruct. Over at The Neighborhood of God the post requested by Erico is up. NB This is my version of Dymphna, drawn from various accounts read over the last few years -- ever since I discovered her when a bookmark with her likeness and a prayer to her fell out of a used book I'd ordered through the mail. Proceed over there at your own risk. The blogosphere increases geometrically, spawning sites into the ethernet at a prodigious rate. If not up yet to the speed of light, no doubt it will be shortly. Recently there tottered onto the stage, dragging the modest banner of Insignificant Microbe behind its small self, and blinking in the light of sudden blogdom, another such effort: Yet Another Really Great Blog. It is this stage to which I recommend that you repair and take your seat for the show. On the marquee (not the html “marquee,” but the old fashioned one which displayed film titles and the movie stars appearing therein) you will find talent, that were it displayed in some economic form, would surely be a heap of gold coins high enough to bring Scrooge McDuck running. Just look at this list of contributors! To paraphrase President Kennedy, there hasn’t been this much brain power in one place since Thomas Jefferson dined alone. I would add John Quincy Adams and James Madison to mix, with a dash of Benjamin Franklin to add some reality to President Kennedy’s quip. Commonwealth of Virginia heresy alert: Jefferson wasn’t that smart, but he was immensely curious. Curiosity, the energy that fuels desire, is its own brilliance. YARGB’s subtitle is “Flares Into Darkness,” a statement both hopeful and sad. It evokes Plato’s Cave, with contributors occasionally providing bursts of light to illuminate the place. I bring this conglomerate to your attention not only because of the breadth and depth of its contributors but because the notion of bringing together seasoned commenters, intelligent and probably simpatico voices in the cave, is the future wave of blogging. As anyone who blogs frequently knows, posting with any regularity on your ownsome chews up brain cells and spits them out at a great pace. Not a pretty sight when a post goes three ways wrong and then Blogger melts down, leaving your essay forever in Limbo instead of on the screen (yes, I do indeed know and often follow the wisdom of the cut and paste before finally attempting to put a post to bed, but sometimes, when the pile around my chair of chewed and discarded neurons has begun to slide and topple, I forgets). That’s probably why there are so many started-and-abandoned blogs floating around out there. The strain was simply too much. Besides the limits of working alone, I intuit there is a synergy created when the blog is spread across a group such as this. The notion of Koinonia comes to mind here. There are religious uses for this word from koine Greek, but in this case, koinonia appears to have been an idea which grew from Wilfrid Bion’s seminal work with groups in England following World War II. His ideas and their applications grew from his initial interactions with “shell-shocked” soldiers in veterans’ hospitals and his subsequent observation of “regular folks” in the civilian world in post-World War II London. A study of the larger group, focusing on the processes and dynamics whereby the group micro-culture emerges. As the initial frustrations of the group find expression in hate, this is transformed through dialogue to what the Greeks knew as ‘koinonia’, or the state of impersonal fellowship. Even though the book was written in the ’90s it seems already dated to some extent. Perhaps because the England in which it was written is fast disappearing into a chunk of Islamicized EU, losing its identity in the process. Happily, to some extent Demare’s hope is being lived out in the blogosphere (thank you, Mr. Quick), though it is far too early to even guess what forms will metamorphose from this process. Whatever they may be, Yet Another Really Great Blog, shooting off its flares into darkness, may be a forerunner. Yes, there are other group bloggers and aggregates out there. But these people, who seem to have emerged full blown from the world of commenters, may be in a different category. Whether or not this accurately represents who they are, YARGB is nonetheless a sensational aggregation. May they flourish beyond their original dreams. Meanwhile, over there among a rich variety of posts on Godel’s theorem and ol’ Harriet’s nomination and disquisitions on the bird flu, discover what happened to The Girl from Ipanema. Yes, she was a real person. Given my predilection for sadness over lost dreams and how others’ hatred can trip us up, this post left me in tears. Late at night, over a glass of Jameson’s this is to be expected. However, on a lovely October morning, tears for the slings and arrows directed at another simply because she existed are more disquieting; they are a hot blade and cut more deeply than late-night lachrymosia (yes, it is my own neologism). Perhaps it is the threat of the destruction of beauty, simply because it was beautiful and therefore aroused curiosity and desire. WARNING: reading the post may undercut any cherished ideas of “fair” you may have secreted away, waiting for better times. Disclaimer: No, this is not a case of mutual back-scratching. Gates of Vienna is not blogrolled at YARGB. Maybe if we work real hard to improve, attaining The List is possible. It’s an illustrious but select group — I intuit we aren’t there. Yet. A Turkish court fined 20 people for using the letters Q and W on placards at a Kurdish new year celebration, under a law banning characters not used in the Turkish alphabet, rights campaigners said on Tuesday. The court in the southeastern city of Siirt fined each of the 20 people 100 new lira for holding up the placards, written in Kurdish, at the event last year. The letters Q and W do not exist in the Turkish alphabet, but are used in Kurdish. Quick, Walid! Bring the eraser and whiteout! Many shops and companies in Turkey have names, signs and advertising using the letters Q, W and X which are not used in Turkish, in apparent violation of the 1928 law, but have not been prosecuted. So if you’re Kurdish, you’d better watch your P’s W’s and Q’s.